The Days of Johann, an agility dog! 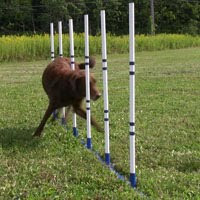 : What's new for agility training, handlers and dogs! What's new for agility training, handlers and dogs! And the new VersaWeaves from AffordableAgility.com - you can use them as competition weaves, channel weaves or 2x2 weaves, at 21" on center. (Just click on the link and visit the 'What's new' section. And here's what's coming soon!